Concerned indigenous groups have raised the possibility of lodging an injunction against plans to flare gas at Leigh Creek. INDIGENOUS groups in the Leigh Creek area are considering lodging a court injunction to block the “dirty, filthy business” of underground coal gasification going ahead in the area. it is working constructively with the appropriate native title group for the region and the company has done extensive work to ensure the project will be environmentally sustainable. The controversy has emerged a week before a crucial vote on a capital raising vital to progress the project, and a stoush over control of LCK’s largest shareholder. LCK plans to test its UCG process at Leigh Creek before the end of the year, and next week its shareholders will vote on the last tranche of a $21.85 million capital raising to fund the testing. UCG is a controversial process which involves injecting air or oxygen into coal seams and extracting “synthetic gas” through wells drilled into the coal seam. The process was banned in Queensland last year following Linc Energy’s disastrous project at Chinchilla, which that state’s Environment Minister Steven Miles called “the biggest pollution event probably in Queensland’s history”. The Leigh Creek Energy project aims to develop “deep coal resources and produce natural gas, electricity and ammonium nitrate products’’. the geology in the Leigh Creek region was such that the process could be safely carried out and it was in the final stages of preparing its environmental impact report. Once that was finalised and approved by the State Government, the company would run a pilot project to test the process, producing gas. But a community meeting was held in Copley on Wednesday, attended by two indigenous and one community group, where the possibility of lodging an injunction against the “flaring” of gas was raised. The meeting of the Copley Community, Aroona Council and Angamathanha Camp Law Mob discussed trying to legally block the flaring. “It is banned overseas and across Australia, so why should it be introduced near Copley, as if Copley doesn’t matter?’’ she said. Concerns were raised that an “independent hydrology review” had not been carried out, which was “grounds for an injunction’’. LCK representatives this week said they were speaking with the legal native title representatives for the area — the Adnyamathanha Traditional Lands Association — and it had done extensive hydrology work, with an independent consultant performing that work. “As water is a vital resource in regional communities, studies were undertaken to address potential impacts to groundwater and surface water which considered the number and type of aquifers present, the ability for groundwater to move vertically and horizontally and the presence of persons or environment that may be impacted,’’ a company document says. 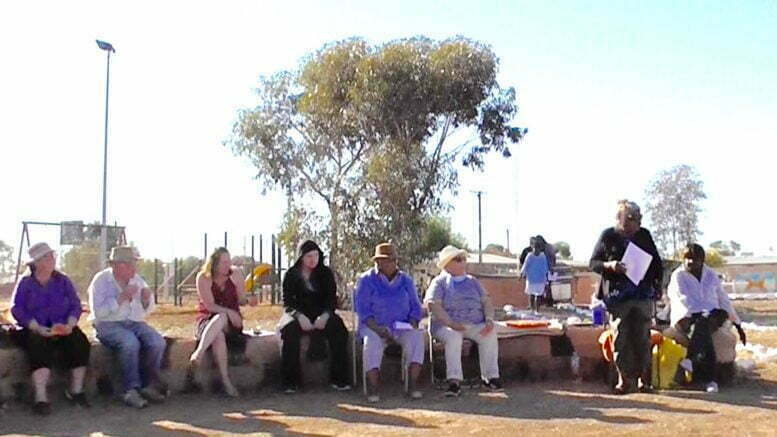 While the Aroona Council and Angamamathanha Camp Law Mob are not the registered native title holders they do have members who are also part of the Adnyamathanha community. The potential injunction comes before a vote next Friday on the final $9.98 million tranche of the capital raising to fund the “pre commercial demonstration (PCD) stage” or gas flaring. LCK has said that if the vote does not approve the share issue, “the company will not be able to progress towards completion of the PCD’’. Executive chairman Justyn Peters wrote to shareholders this week encouraging them to vote, saying “every vote counts and is important in supporting the development of the PCD’’. If the share issue is approved it will take China New Energy Group from its current shareholding of 19.98 per cent to 32.78 per cent and make it the company’s largest shareholder. Shareholder approval is required under Australian law to take a single shareholder past the 20 per cent threshold without launching a takeover bid. In the background former managing director David Shearwood is involved in a court action in the Federal Court, attempting to have himself reinstated to the board of the company’s current largest shareholder Allied Resource Partners, which owns 29.99 per cent of the company. Mr Shearwood earlier this year lodged a bid to call a general meeting at LCK, with the intent of removing Mr Peters from the board. Mr Peters said at the time that Mr Shearwood’s attempt was “highly disruptive” and not in the best interests of the company. Mr Peters is also a director and shareholder of Allied Resource Partners. This relationship was not declared in the company’s annual report but Mr Peters has previously told The Advertiser that: “This information is publicly declared on the Leigh Creek Energy website, in the Chairman’s profile section. It is not required to be disclosed in the annual report’’. Mr Shearwood, and the chairman of ATLA, Vince Coulthard, could not be contacted.